There are 80 million people throughout Europe living with some form of disability or limited mobility, that’s nearly 1 in every 10 people. 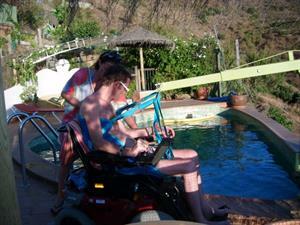 So adapting your holiday home for visitors with disabilities could seriously improve your rental income. Spain has come a long way to improving and updating its facilities and accessibility for residents and visitors with a disability. Tenerife and Barcelona for example, are renowned for offering some of the best adapted facilities in Europe, if not the world, including: adapted hotels, self-catering apartments, transport and equipment. A person with a disability, or who has limited mobility, has to investigate and plan their holiday down to the smallest detail. They are going to be looking for accommodation which is adapted and equipped for their needs and a resort that offers sufficient facilities to allow them to get out and about and enjoy their holiday to the max. Currently there is a very limited portfolio of homes that offer good accessibility for people that are wheelchair bound, or have some form of disability; leaving many visitors with no choice but to book hotel accommodation, even though they would prefer the freedom of renting. You can guarantee when they find the combination of adapted and comfortable self-catering accommodation with a disabled-friendly location, they will be happy to return on a regular basis. And don’t forget that some elderly visitors will also appreciate these types of adaptation, increasing your rental potential further. So what do we need in place to turn our holiday rental into accessible accommodation? If you want to adapt your home into disabled-friendly accomodation, or are considering buying-to-rent and want to maximise your investment, there are standard specifications that must be adhered to. Completely adapting your home is a big project, but you will be surprised at some of the simpler things you can do to stay one step ahead of the competition. 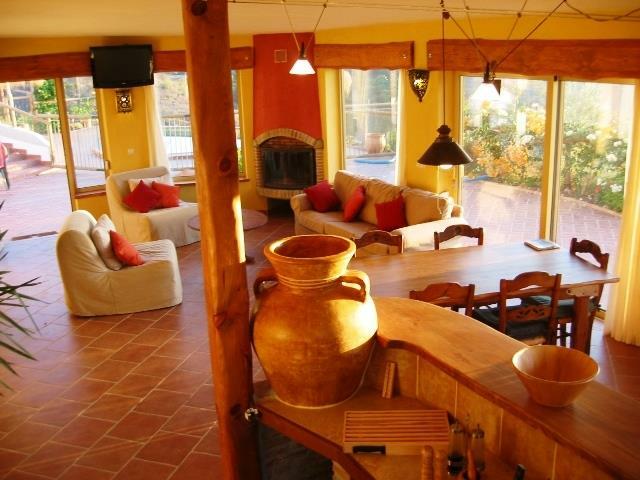 Take 10 minutes to read through the specifications required to see if this could be an option for your holiday rental. It is important to have a large parking space for ease of getting in and out of the car and also getting a wheelchair out. It’s also important that your parking space is close to the property itself. The space should be at least 3.7 metres wide and be no more than 50 metres away from the entrance to your holiday home. If your parking is on the street, you should install the international disabled parking space symbol, so that other drivers are aware that they are unable to use the space. From the parking space to the front entrance, the floor surface must be flat, level and slip resistant. If there are steps or a graduation to the entrance, then you will need to build a ramp with a maximum incline of 1.12 metres. Make sure the surface is firm; building a wooden ramp for example is not an option. And as before the ramp must be slip resistant. If you install a ramp, the space directly outside the property entrance should include a landing of 1.5m2 in front of the door; room for the wheelchair to be able to turn and manoeuvre, without a problem. The landing must be flat with no inclination. The standard main entrance door should be at least 80 centimetres wide. Door handles, key locks and light switches must be easily reachable at a maximum height of 140 centimetres. Ideally light switches will be illuminated or have something that indicates their location. If you have a door that opens outwards, you need to plan extra space in front of the door, so that it can be opened and the wheelchair pass without problem. As the front door, all the interior doors should also be at least 75 centimetres wide and there should be no level change between rooms. This also applies to patio doors leading to exterior spaces. Ideally you should install horizontal pull or lever action door handles, no higher than 90-120 centimetres above floor level. Ideally your kitchen will have plenty of room to turn a wheelchair, at least 1.5 m² of floor space. If you can, it’s an added benefit to leave space for knee and foot rests under the sink and work tops. The hob should be a maximum of 85 centimetres high and all switches, levers and light switches should be within reach (90-120 centimetres) and be easy to operate. When purchasing a bed make sure that the height is no less than 45 cms and if possible the height should be adaptable with bed blocks. The bed should be firm and there must be plenty of space to manoeuvre a wheelchair around the bedside, without banging into bedroom furniture. Leave at least 80 centimetres around each side. Some guests may need a mobile lifter, so there should be at least 15 centimetres of free space under the bed to allow for this. Doors should ideally open outwards and there must be plenty of space inside to manoeuvre a wheelchair, at least a 1.5m space free of obstacles. The floor should have an anti-slip finish, as should the bath and/or shower. A toilet should be between 44-47 cm high and there should be two firmly anchored support bars on each side. The bars should be hinged and be able to swing away from the toilet. The bar itself should be 70-75 cm in height. The sink should be reachable, whilst sat on the toilet and on the other side there should be a clear space, 80 cm is the recommended width; room for assistance if needed. As in the kitchen, there should be a space under the washbasin for knee and foot rests and it’s recommended that the rim of the washbasin sit at a minimum of 70 centimetres above ground level. 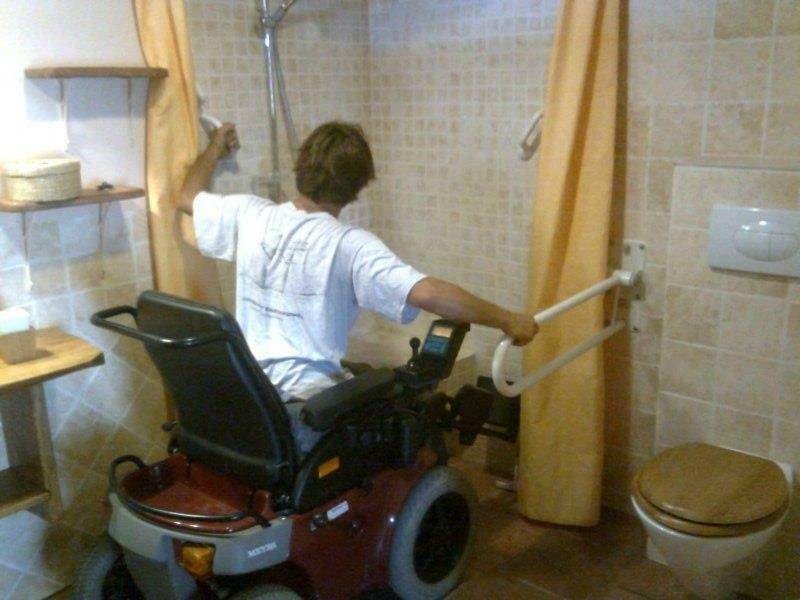 It’s recommended that the shower or bath, have a collapsible bath seat or shower chair, as well as a handrail to get in and out and for extra support. All taps and shower hoses must be reachable from a seated position. There must be a clear 80 centimetre space to get in and out of the shower. If there is only one bathroom, it must incorporate a roll-in shower, dimensions of 135 x 135 cm or 235 x 235 cm if assistance is needed.The floor should have no more than a 2% decline towards the plug hole. There should be no step up or over to enter the shower area. A bath should be no more than 45 cms in height, unless there is a hoist available. Don’t forget that all towel rails, toilet roll holders, soap dispensers, etc. should all be at reachable level, approximately 90 centimetres from the floor. Also mirrors should be at a suitable level. As mentioned above, make sure that the ground stays level between the interior and access point i.e. patio doors. If there are stairs down to a pool or garden, you will need to construct a ramp, as with the entrance. To access the pool, steps and a hoist are minimum requirements, but there other options such as a pool ramp, access stairs or a portable slide. It’s also important that the pool is no deeper than 2 metres. If you welcome pets in your holiday rental it’s a good idea to mention in your property description that you welcome service dogs, who help owners with impaired visibility, etc. Installing a hearing induction loop for those with hearing disabilities is simple and inexpensive and will add a big plus to your home for the hard of hearing. Make sure you provide a remote control for equipment such as the television, stereo or air conditioning. It’s recommended that door handles are lever handles, rather than knobs. It’s also recommended that furniture and kitchen units have rounded edges. Maintain a cable-free home, specifically don’t leave cables lying on the floor. And carpets and rugs can also hinder mobility around the home. Leaving information for guests, such as a list of disabled friendly amenities, equipment hire, trips, etc. will really make them feel at home. Even offer to book the equipment for them, so it will be there on arrival. All these details, make a huge difference to your guests holiday experience. It’s really important to give as much detail in your description and promotion about what adaptations you have put in place. Different disabilities require specific adaptations, so you will need to be very exact with your details. The more information you give, the more guests you will attract. Clarify every point, as we have detailed above and include photos of all the apparatus and fittings that you have installed, starting from arrival and working your way through your home. The great thing about implementing these changes is that you can also list your holiday rental on accessible tourism websites, further highlighting your holiday rental online. 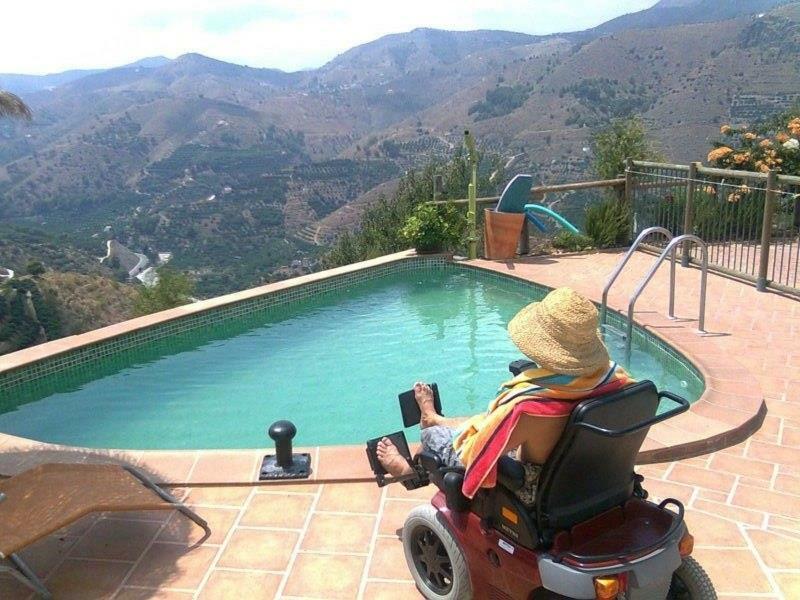 If you are still unsure about what counts visit these links to understand in more detail what you can do to adapt your holiday home into an accessible holiday rental.